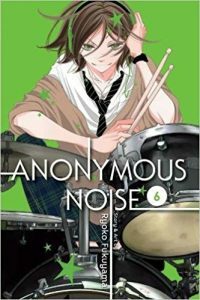 Anonymous Noise, sometimes I find this series a little infuriating because I’m not fond of the dynamics in the Nino-Yuzu-Momo love triangle, where Nino as muse gets bounced back and forth between two songwriters while everyone keeps hiding their feelings for various reasons. On the other hand this series does bring a regular dose of rock band drama, which I do appreciate. I found this volume more entertaining, probably because there was a bit more focus on the supporting cast. This volume starts out with the aftermath of the In No Hurry vs Silent Black Kitty battle of the bands, where Nino runs after Momo, gets rejected, Yuzu shows up to pick up the pieces, and then decides to lie about his feelings again. Momo vanishes and Nino’s psychosomatic reaction is to have difficulty singing again, but she does hang out Miou a little bit, which I am taking as an indication that my dream ending for the series, where Momo and Miou forswear all men to launch an all girl band is totally going to happen. One thing that I was quite thrilled with is that Miou finally decides to take a chance on Haruyoshi, who has been pursuing her forever. Nino is determined to get back her voice, and Yuzu and Momo are dealing with their obsessions in their own way, as Yuzu buries himself in songwriting, and Momo attempts to get Yuzu to slip one of his songs to Nino. The circular nature of the love triangle leads back to Nino yet again having to choose between the two songwriters. I don’t know, as I put down this volume I found myself much more invested in the Miou/Haruyoshi romance, because it at least seems to be progressing somewhere! I still read this for the reliable angst and rock band poses, but I would really really like to see a little more progression for the main characters. Also, I miss cranky Nino, and hope she will manifest the snarkiness she exhibited during her band’s radio interview. Will that happen in volume 7??? ?